When, out of the blue, over dinner in Siena, you get asked if you’d like to spend a day looking for movie locations in Tuscany in a top spec Skoda Yeti, then take two more days driving the car back to England, you don’t turn it down. And so, next morning, in the company of one George Fowler, esteemed motoring editor of the Daily Star, I ventured out into the bright Tuscan sunshine only for George to ask me to close the sunroof because its rays were burning his head. On the recommendation of the hotel receptionist, we headed for the seaside resort of Follonica, reasoning that it might provide some interesting backdrops and afford us the opportunity of snaffling an Italian ice cream. Unfortunately, our route took us on the main road via Grosetto and, after negotiating Siena’s labyrinthine traffic system, we discovered that the main road was under reconstruction. Worse than that we found ourselves at the end of a snake behind a lorry carrying a roadsweeper at 20mph, for mile upon mile, with no opportunity to overtake. Eventually the driver pulled over to let everyone past and we made some progress before stopping for a late morning coffee at a café behind a garage just after the turn for Follonica. A coffee wasn’t enough because on display on the counter were various types of pizza and an extraordinary concoction I can only describe as a green bean pie. Freshly baked, still warm, thin, flaky pastry, topped with salami, topped with white sauce, then copious quantities of green beans, then more white sauce, then a topping of thin flaky pastry. At 4 Euros for an 8” x 4” rectangle, I should have said no, but not one to pass up an opportunity like this, I didn’t. I stuffed my face. Then, because it was 1.00pm, the place suddenly filled up Italian families and truck drivers in search of food and became as alive and animated as Italian cafes often do. Highly recommended. Everyone was tucking into the bean pie signature dish. It really needed a decent bottle of wine. When we arrived at Follonica, more by luck than anything else, we parked the Yeti behind a row of bungalows built directly onto the beach. We walked through one of the gaps onto flat, hard sand with a view across the sea to the island of Elba, then turned right and headed into town in search of a gelateria. It seems that, not being the most fashionable of resorts on the Italian Mediterranean coast, Follonica enjoys a short tourist season. Every ice creamery in the town was closed for lunch. We could peer through darkened to the delights in display cabinets within, but were not allowed to buy any until 4.30 in the afternoon that was two hours away. So we headed back to the car, crossing a bridge over a stream swarming with small fish trapped by the tide, testifying to the effectiveness of the town’s sewage treatment plant. The beach house with the tower is for sale, incidentally. Some of the bungalows on the sea were small bars and restaurants, probably only ever open from June to September. It reminded me of sleepy Mediterranean resort towns 50 years ago rather than now. Having failed to find a decent location for Skoda’s film crews, we thought we’d better head back via the hill town of Massa that was marked on the map with several monumental symbols. Massa is stunning, as only a Tuscan hill town can be. And it’s not just a tourist trap. People live there and work small factories, workshops and garages directly off the narrow streets. They have become very good at parking. Just off the square we found a gelateria to die for. Three colossal scoops for 2.2 Euros. So much it was almost impossible to consume before it melted. Then, as we headed back to the Yeti, a red 1960s sports car rounded the corner. Not just any sportscar. An Austin Healey Innocenti Sprite. The one with wind-up side windows before BMC got round to fitting them. At auction in the UK at least £20,000 worth, but there simply being enjoyed by a guy and a girl who maybe lived there or who may have been tourists with impeccable taste. I have nothing to report of our return journey to the Borgo Scopeto except that we let a Ferrari 458 overtake us and there turned out to be at least three Borgo Scopetos in the immediate vicinity of the one where we were staying and the satnav insisted on taking us to the wrong ones. So we had to resort to common sense. Next day, bright and early, we packed up our stuff and set forth on our route to Farnborough via Turin and Dijon. The chap who planned it for us warned that during the first 988 kilometre stage, the satnav might divert us around some traffic jams. So, believing his every word, we weren’t too worried that it was aiming us towards Perugia, south west of the direction we should have been going. 250 kilometres later, emerging from Umbria at Ravenna, we finally noticed that our remaining journey was still more than 1,100 kilometres and that our estimated time of arrival in Dijon was 00.39 next morning. Someone, at some time, must have pressed the ‘avoid toll roads’ button. We made another fuel and coffee stop at a place packed with excitable Italians creating the usual cheerful commotion and re-set the satnav for Ferrara, then Verona. Up to that point we’d been averaging a very creditable 45mpg. From Turin through the Frejus tunnel under the Alps into France and it began to rain. Not just rain, it hammered down, with a vengeance,. Rivers beside the road threatened to burst their banks. We were glad of the Yeti’s four-wheel drive. It didn’t stop raining until we reached Lyon. But from then on the going was straightforward until, at just after 9.00pm, we reached our rest stop for the night. The 525-year-old Hotel Philippe Le Bon in the centre of Dijon that just happens to be blessed with the excellent Les Oenophiles restaurant. The story went that the original mansion housing the restaurant had been built in the 1490s by the nobleman Thomas Berbisey, who constructed its Gothic courtyard and balustrade supported by a central pillar of Chestnut carved to depict Saint Thomas touching the wounds of Jesus Christ. Another more modern wooden pillar supports the original massive roof timbers of the restaurant that would otherwise collapse. 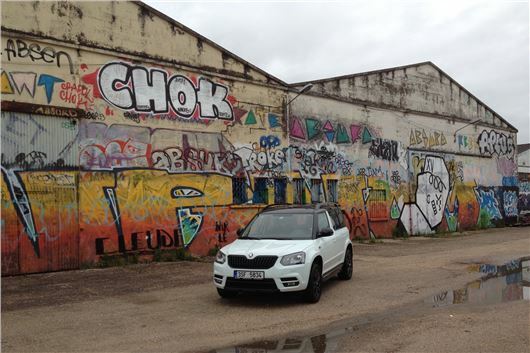 On our final day, we took ourselves out of Dijon to the A31, passing a derelict factory adorned and apparently dedicated to competitive graffiti. We re-filled with quite a lot of fuel because the previous day’s rain and pounding of Autoroute had seen consumption rise to 29mpg. There’s nothing interesting to write about that that stint of the journey, except we got through it fairly quickly, arriving at Calais Vin to re-stock in the early afternoon. One way on the Eurostar was an expensive 224 Euros, but getting on, getting through the tunnel and getting off again was the usually efficient process. We arrived back at Farnborough at around 4.00pm, unloaded the Yeti, loaded our cars and headed for home. Over 1,283 miles we averaged 33.79mpg, total journey distance 1,438 miles. And, to the great credit of the Yeti, not a single twinge of back pain. Many thanks to Bernd Abel, Piek von Bestenbostel, Simone Beck and the Skoda team who prepared and sent us on our journey. What happened to the Road Test?